If you are interested in alchemy then perhaps you’ll enjoy the new slot Gold Lab which has just been released by Quickspin. It is a 5 reel, 25 payline slot with the reels set on a large piece of machinery with the mad scientist looking in. There are five high value symbols which comprise of five gems of different colours: red, pink, green, purple and blue. The wild symbol is a big gold ‘Wild’ and there is a Golden Bonus beaker icon. 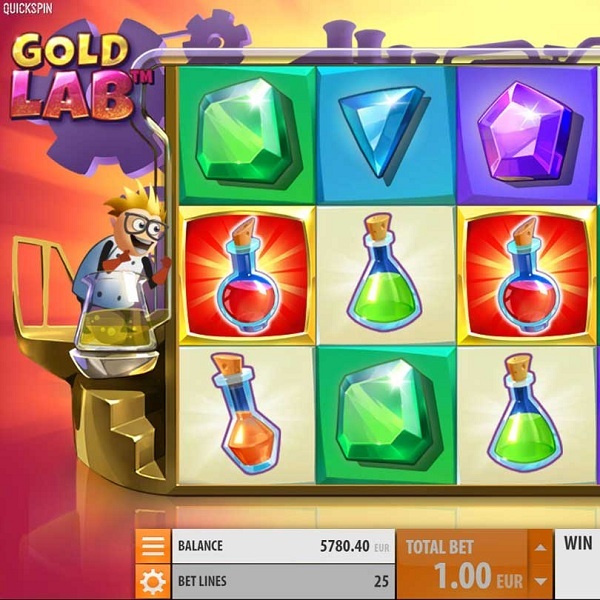 If you can land three of the Golden Bonus scatter symbol on reels 1, 3 and 5 then you will receive four free spins during which any low value symbols on the reels which match the colours of the bonus beakers become wild for the duration of the spins. If a Golden Bonus symbol lands it will award an extra spin.